I am so in LOVE with this chocolate cake recipe! I’ve made it before, in this blog post, Gluten-Free Chocolate Cake. I don’t use flour. I use almond meal instead. I also have been experimenting with the recipe by using less and less sugar each time. I’m down to 70g of sugar, it still tastes amazing and it’s still a winner every time I make it (original recipe asked for 100g). 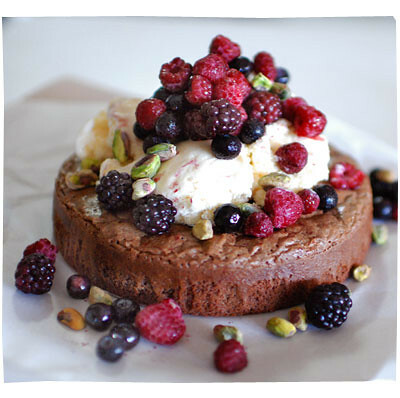 In this picture, I served it with homemade ice cream, mixed berries and roasted pistachios. 1. Preheat oven to 160C. Line a 20cm round cake tin with baking paper. 3. Whisk the egg whites until you can make firm peaks when you lift the whisk up. 5. Fold in the egg whites into the chocolate mixture, until well combined. Pour into cake tin. 6. Bake for 30 minutes or until your skewer comes out clean. Cool in the tin for another 10 minutes. Turn the cake onto a plate to cool completely. 7. Add toppings and serve immediately!